Last fall, my Mom and I ventured to Nashville, Tennessee for a rare, but special, Mother-Daughter weekend. Neither of us had never been there, so we could not wait to explore the area. Our main stop was attending the Fall Supper Club that the beautiful McKel Hill of Nutrition Stripped hosted at Bloomsbury Farm. I have so many wonderful things to say about the dinner, but her pictures from the event really do the best at expressing how lovely it was (and if you look closely, you can even see pictures of my Mom and me at the farm:) ). From the picturesque greenhouse setting, to the delicious food served family style, to the live music by Elenowen, I was reluctant to head back to our hotel for the evening. It was pretty neat to finally meet McKel in person, and she has a wonderful positive energy about her that is even more magnetic than it is on her website. During the rest of our stay, we wandered around Nashville, learning that Nashville is not really a walking city, that despite that fact, it is not easy to find cabs there, and that Marché Artisan Foods is worth a visit for breakfast, brunch, or lunch...whatever you call that first meal of your Saturday morning. I had read some good reviews for Marché on Yelp, which our hotel doorman- and the line out the door upon our arrival- confirmed. The food coming out the kitchen looked simple, but delicious. When we finally got a table, I knew immediately what I wanted because I had seen a few of them go by me on the waitress' trays only to be devoured by happy customers. I cannot remember exactly what they called it, but it was essentially a grits casserole stuffed with ricotta, goat cheese, spinach, and mozzarella. A fried egg lounged on top. Being from North Carolina, I have a thing for grits, and the stiffer texture of the grits in this casserole was really satisfying. I had been wanting to recreate what I had at Marché's for some time, and after a few attempts, I think this one is a winner, albeit a bit lighter than their version. 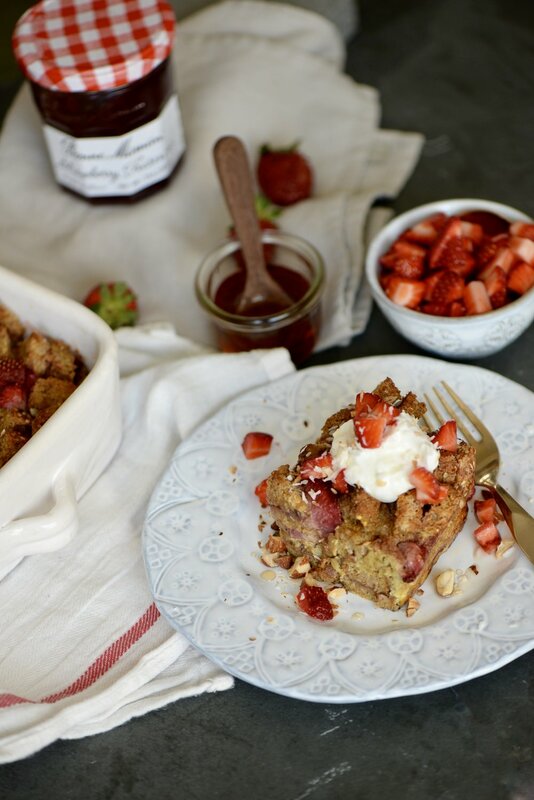 This is a perfect make-ahead dish for a breakfast or brunch, especially with Mother's Day right around the corner. Then again, I have been eating it for lunch and dinner, and find it absolutely satisfying. I have to take a moment to thank my friend Olivia and her mother for supplying me with three ingredients that really made this dish so special when I made it this last time. Olivia and I recently became friends during a yoga teacher training program, and I was so fascinated to learn that her mother in Virginia grows vegetables for the local farmers' market and raises goats for goat's milk, yogurt, and cheese. Olivia, being incredibly generous and kind, recently gifted me an Egyptian Walking Onion plant, a dozen eggs, and a jar of homemade goat cheese flavored with bits of Egyptian Walking Onion. The goat cheese is heavenly...worthy of being eaten by the spoonful, and the eggs have a deep sunset yellow yolk. The scallions have the slightest garlic flavor. To celebrate these food gifts and my new friendship with Olivia, I incorporated all of those ingredients into this dish, giving it tremendous flavor and brightness. I urge you to seek out a local goat cheese and local eggs, maybe finding fresh chives or scallions at the local farmers' market to really get the best flavor. I hope you enjoy! Begin with the grits. Bring 4 cups of water to boil over high heat in a medium saucepan. Add the grits, whisking to combine. Bring to a boil, and then reduce heat to low, stirring occasionally to prevent sticking on the bottom. When the grits are tender, after about 45-50 minutes, and the mixture has thickened, remove from heat, add the salt and olive oil, and stir to combine. Taste and adjust the seasoning to your liking. Meanwhile, prepare the filling. 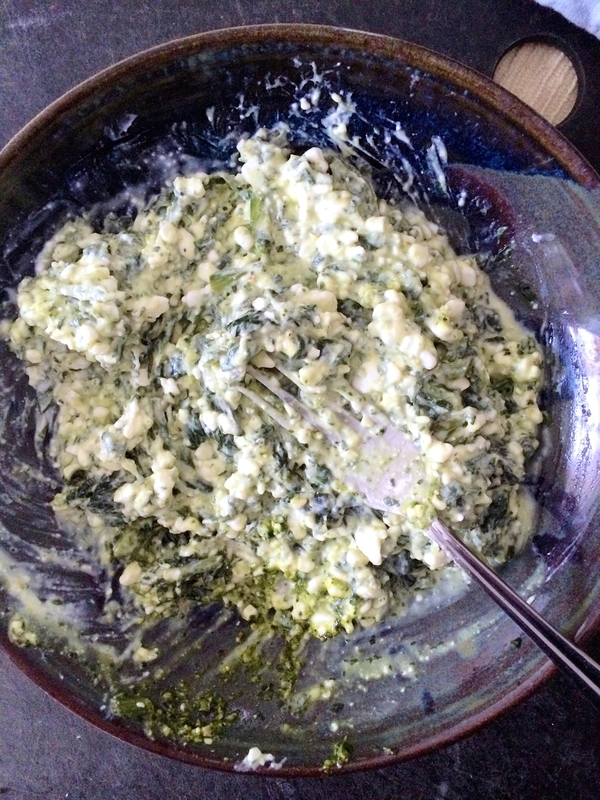 In a medium bowl, combine the drained spinach, ricotta cheese, goat cheese, egg, salt, basil pesto, and chopped scallions. Stir to combine. In a square baking dish, pour half of the grits into the pan, spreading into an even layer. Sprinkle with 1/2 c. of grated mozzarella cheese. Spoon the filling over top and spread until even. Sprinkle the filling with the remaining 1/2 c. of grated mozzarella. Carefully spread the remaining grits over top in an even layer. Cover and place in the fridge for at least 2 hours or overnight. Preheat oven to 400 degrees Fahrenheit. Remove any covering from the grits. Place the pan in the oven and bake for 45-50 minutes or until the top is golden. Remove from oven and let cool 15 minutes before serving. Garnish with chives or scallions, Parmigiano-Reggiano, and an egg or two, if desired. Serves 6. * I used these Carolina Grits for the grits. There is a lot of debate on what the differences between polenta, grits, and cornmeal are, and those differences are based on the type of corn used and the degree of milling. For this recipe, try to find a coarser ground corn meal- not too fine, often labeled stone-ground. * You can use fresh spinach, either steaming it gently or sautéing it, and then squeezing any excess moisture out of it before chopping. * Pecorino romano or parmesan cheese work well to garnish, too.